Past Forward, a series of programs celebrating and exploring the ongoing influence of the artists that created the legendary Judson Dance Theater, will be seen across the United States beginning in Anchorage Alaska, October 3-5. Created and produced by Mikhail Baryshnikov’s White Oak Dance Project, PastForward is comprised of seminal dances dating from 1961, as well as new works by many of the major artists of the historic period. A video by Charles Atlas incorporating original footage will introduce each program. In addition to Anchorage, PastForward will be seen in Lawrence, Kansas, October 10 & 11; Tempe, Arizona, October 15; Maui, Hawaii, October 19-21; Los Angeles, California; October 25-28; Berkeley, California, November 1-4; Pittsburgh, Pennsylvania, November 7 & 8; Washington, DC, November 10 & 11; Chicago, Illinois, November 15-19. Attached is a complete touring schedule. PastForward was initiated by Baryshnikov, who wanted to capture the spirit and assure the preservation of that era (approximately 1962-63) when dance, music, theater and visual artists were criss-crossing boundaries and re-defining the possibilities of the art form. It was at Judson that post modern dance had its beginning. Among the era’s landmark works that have been revived for White Oak are Simone Forti’s “Huddle” (1961); Lucinda Childs’s “Carnation” (1964); Trisha Brown’s “Homemade” (1965); Yvonne Rainer’s “Trio A Pressured #3” (1966); Steve Paxton’s “Satisfyin Lover” (1967) and “Flat” (1964). There will also be performances of Simone Forti’s “Scramble” (1970); David Gordon’s “Chair” (1975), “The Matter” (1979) and “Beethoven” (1998); as well as Lucinda Childs’s “Concerto” (1993) and an excerpt from Trisha Brown’s “Foray-Foret” (1990). The new dances, all commissioned by Baryshnikov Dance Foundation, include Yvonne Rainer’s “After Many A Summer Dies the Swan,” marking Rainer’s first dance in 25 years. (She has been working as a filmmaker since 1971). Past Forward programs also feature premieres by Judson alumni David Gordon (“For the Love of Rehearsal,” and Deborah Hay (”Whizz” and “Single Duet”) . PastForward is produced by the Baryshnikov Dance Foundation with Mr. Baryshnikov serving as artistic director and David Gordon as Director/performance. Charles Atlas is the diresctor/media; Jim Lewis is Dramaturg/writer for the project, and Jennifer Tipton, the lighting designer. In addition to Mr. Baryshnikov, PastForward performers include Raquel Aedo, Tadej Brdnik, Emily Coates, Rosalynde LeBlanc, Michael Lomeka, and Emmanuele Phuon. 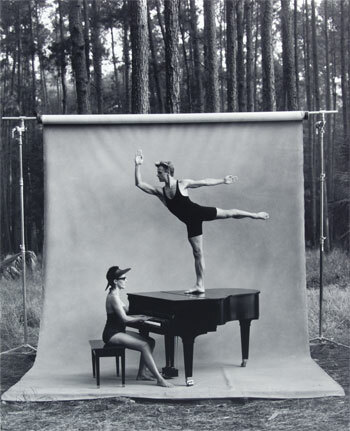 White Oak Dance Project was created in 1990 by Baryshnikov and choreographer Mark Morris. Comprised of some of the finest dance artists in the United States, White Oak features alumni of major dance companies such as New York City Ballet, Mark Morris Dance Group, Elisa Monte Dance Company, and Bill T. Jones/Arnie Zane Dance Company. Since its beginning ten years ago, White Oak has commissioned over forty new dances by established masters and emerging artists, in addition to acquiring over twenty existing works. The ten year old company has already been seen in almost every major venue in the world during its thirty national and international ours. Major sponsorship for PastForward has been provided by the Howard Gilman foundation with additional funding provided by the Sylvia and Danny Kaye foundation and Robert Mondavi Winery.